London (AFP) - Kevin Pietersen said he'd been offered a "lifeline" after he capped what could turn out to be a memorable week in his turbulent career with a century on his Surrey return. Pietersen has not played for England since being controversially axed last year following the 5-0 Ashes series loss in Australia. But this week saw the England and Wales Cricket Board (ECB) sack managing director Paul Downton, who played a key role in the decision to send the 34-year-old star batsman into international exile. Sunday saw Pietersen score 170 in Surrey's 420 for seven at The Parks on the opening day of a three-day match against MCC Universities Oxford -- his first hundred in any form of cricket since the Old Trafford Ashes Test of 2013. It was a timely knock, albeit the match wasn't first-class, with his hundred coming just a day before the start of England's three-Test series against the West Indies in Antigua. Incoming ECB chairman Colin Graves, who takes charge next month, has, in contrast to the previous regime, suggested Pietersen could force his way back into the England set-up through sheer weight of county runs. "I've been given a lifeline," Pietersen said. "I really, really like the way that the new bosses are talking, from stuff that you read and stuff that you hear. "English cricket needs to change...They've started to make some changes. "I just want England winning. I've not been happy over the last 14 months because England keep losing. It's not nice. "England were the first team to leave Australia (at the recent World Cup). I was on the plane that way, they were on the plane the other way round. "It's not nice as an England fan, as somebody who has played passionately for England every single time I've gone out and played. "Anything that can help England win, I'm all for," the former England captain added. All I've got to do is score runs. "That's what was asked of me today and I've delivered." 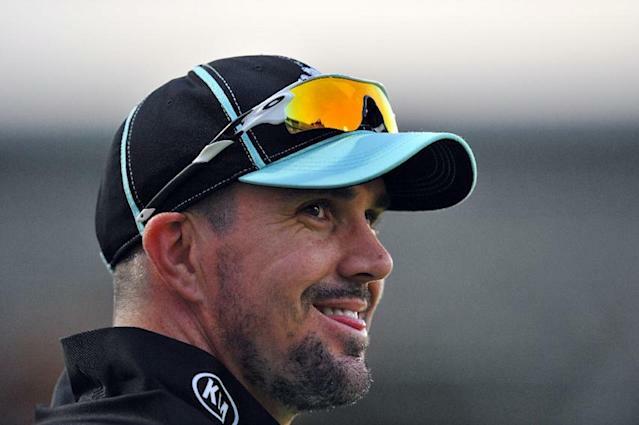 South Africa-born Pietersen, England's leading all-time international run-scorer across all formats, gave up an Indian Premier League contract to re-sign with Surrey in a bid to prove the seriousness of his desire for an international recall. Pietersen faced 149 balls, including 24 fours and two sixes, on Sunday. He was dismissed when Jack McIver caught him at midwicket off Abidine Sakande after Pietersen had been dropped twice earlier in his innings.